I completed a four year program in Chinese medicine (acupuncture, Chinese herbs, and nutrition) at the Medisin College in Tel Aviv. My training included a month-long internship at the Guang' Anmen hospital in Beijing, China. 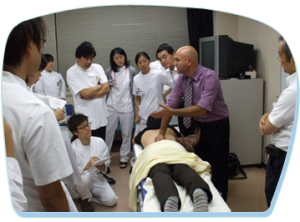 I also completed an advanced two-year program in Japanese medicine at the distinguished "Kikko Matsumoto International Program." The program included a short internship in a Boston clinic. My continued training included a two year course in shiatsu therapy, a six-month course in nutrition counseling, and a one-year course in lymph massage therapy. During October 2011,I had studied "Kampo", Japanese treatments by using herbs formulas, in Kitasato university,in Tokyo ,Japan. Japanese acupuncture is very gentle and pain-free, and often uses modern equipment to encourage and hasten recovery. The first meeting includes an extensive diagnostic interview and examination of dozens of reflex areas to enable the therapist to ascertain the root of the problem or problems. Duration of treatment depends on the complexity of the problems, but noticeable relief is often nearly immediate. I have been using modern Japanese diagnostics to treat patients with a variety of health problems since 1997. My patients have included pregnant women, children and infants. I am convinced that these methods effectively link between Western diagnostics and traditional acupuncture treatments. I am currently writing the first Hebrew book on this fascinating, important and ground breaking field in modern medicine. Experience with my patients has proven to me that combining modern diagnostics with traditional healing techniques is often a sure and swift way to relief and recovery. I am available to lecture and present workshops to the general public on a variety of topics related to complementary medicine. Lectures are easily understandable and do not require previous knowledge, and include examples from clinical cases as well as the most up to date diagnostic and treatment methods. Lectures can be tailored to specific audience interest. Please feel free to contact me for inquiries.